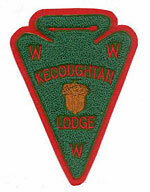 Although Standard Pennant Company of Big Run, PA was the manufacturer for the first 3 Kecoughtan chenille emblems, Krelman Company of Pueblo, CO was selected by the Lodge to create the final chenille patch which was patterned after the Lodge's first green arrowhead patch from the early 50's. The C-4 was sort of my idea as well. I liked how Blue Heron made a chenille using their A-1 design and mentioned that we should do the same thing. Don't know why they came from a different manufacturer, but it was probably because it was cheaper. 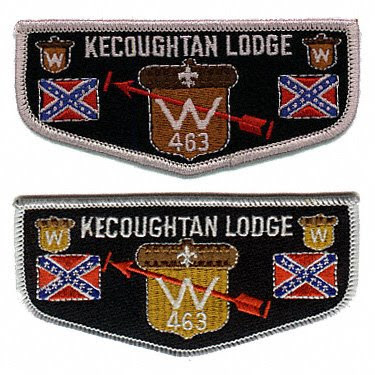 Since Kecoughtan officially merged with Chanco to form Wahunsenakah Lodge at the beginning of 1996, the C-4 chenille was issued in the twilight of the Lodge's existence, and represents a fitting tribute to the original arrowhead patch design from the earliest years of Kecoughtan Lodge. In mid-September 2009 Mike McCaughan sent me a picture of a prototype Kecoughtan C-3 chenille that I had never seen before. Unlike the released version with a red felt background this prototype had a tan felt background. While researching this emblem I consulted Jeff Godby, who was Lodge Chief at the time and whose father, Dr. Ron Godby, was the Lodge Trading Post Advisor responsible for ordering this chenille issue. Jeff confirmed the existence of the tan C-3 prototype and sent me pictures of one from his collection with the only difference being that the prototype Mike McCaughan acquired does not have a Standard Pennant Company label on the back while the one in Jeff's collection does. I was Lodge Chief when we came out with the C-2 and C-3 issues, and it was my idea for the lodge to issue our first chenilles in about 15 years --- good money maker. My father was the trading post advisor, and he was in charge of ordering the chenilles. We gave Krelman & Standard both a shot at the C-2 and went with Standard. 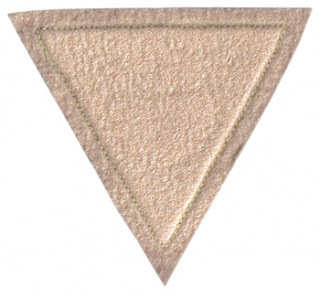 The Krelman prototype is noticeably smaller than the Standard Pennant Company version, and the colors are more subdued. Additionally, the reverse side of the Krelman prototype is black, although when viewed from the front the felt background is red. The Kecoughtan Chenille Emblems page has been updated to include the recently discovered prototype C-2 and C-3 issues. No known prototype of the C-4 is known, but perhaps a surprising discovery awaits! I was pleasantly surprised to see that my article about the Section SE-8 chenille patch issued in 1993 at the final SE-8 conclave was published in the September 2009 edition of the ISCA Journal. Editor James Ellis did an awesome job of reproducing the images I provided to him that illustrate the released and prototype versions of this patch. For those of you who aren't members of the International Scouting Collectors Association and don't receive the Journal, you can view a 3.1 MB PDF version of the cover and my article here. 1991 was a special year for Kecoughtan Lodge. 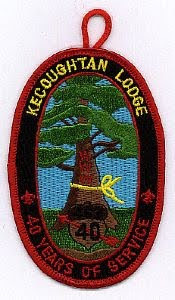 The January 1991 Kecoughtan Kryer displayed a special new masthead and the front page story highlighted the 40th Anniversary of Kecoughtan Lodge. 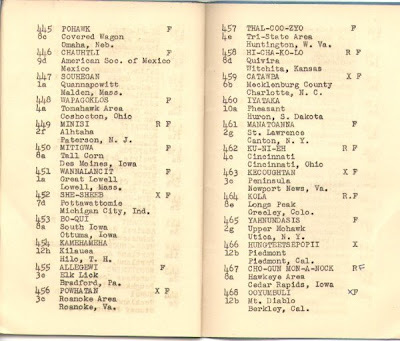 (Arapaho II lists the charter date of Kecoughtan Lodge 463 from official OA records as July 5, 1951). Along with plans for a 40th Anniversary Fellowship to be held June 15-17, 1991 at Camp Chickahominy, the Kryer announced the availability of a special 40th Anniversary chenille patch, available for two months only by preorder at a cost of $14.00. Reportedly 100 of these were ordered. The Lodge's 40th Anniversary Committee published a special anniversary booklet edited by Alex Wiatt entitled A Story of Forty Years of Brotherhood - Kecoughtan Lodge #463, Order of the Arrow. This document remains the most extensively researched and detailed history of the Lodge, spanning over 50 pages and including a checklist of all known Lodge emblems provided by Dr. Ron Godby and Jeff Godby. This booklet was available at the Trading Post during the Fellowship event. 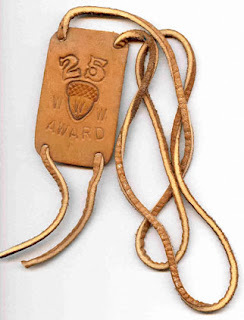 The Lodge issued two special flaps, S25, a restricted issue with a design similar to the standard lodge flap in use at the time with 3 ships, and S26, unrestricted and patterned after the former Lodge flap design, with American flags instead of Confederate ones flanking a large center acorn. The emblem checklist in the Anniversary booklet indicates 500 of each design were ordered. The 40th Anniversary Fellowship featured participant, staff, and beaver day issues, differentiated by their border colors of red, dark yellow, and light blue respectively. These were later classified in the Blue Book as X15, X16, and X17. The emblem checklist lists quantities of these produced as 400 red border, 50 dark yellow border, and 100 light blue border versions. 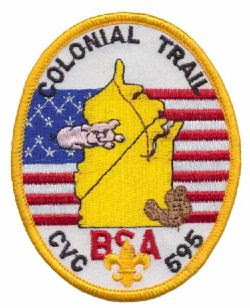 The other event patches for 1991 included the 40th Anniversary acorn logo in their design, as well. The July 1991 edition of the Kryer reported the huge success of the 40th Anniversary Fellowship, with 230 Arrowmen in attendance, with 15 visitors from other Lodges, two of them former SE-8 Chiefs. The Trading Post News column advised that 40th Anniversary chenille emblems were sold out and more than half of the 40th anniversary flaps which arrived at the fellowship on Saturday were gone by Sunday morning. 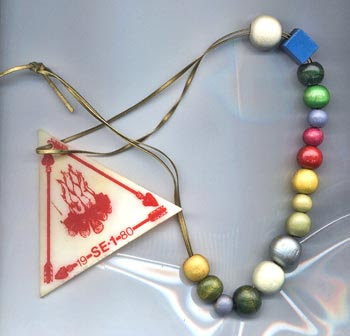 Fortunately the emblems issued by Lodge 463 in 1991 to celebrate its 40th Anniversary remain surprisingly affordable even today, and together make a unique collection to remember this significant milestone in the history of the brotherhood always remembered as Kecoughtan Lodge 463. 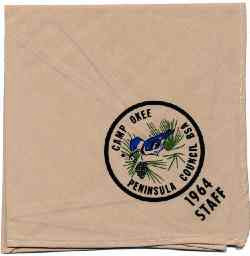 I've spent several hours recently putting my Wahunsenakah Lodge patches into new patch envelopes and pages from besthobbypages.com. 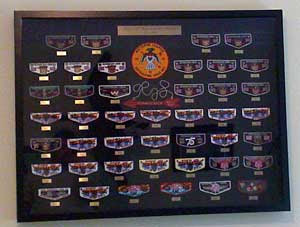 What great products to display patch collections! 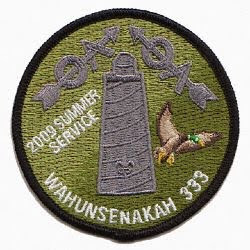 I took a moment to stop my organizational efforts to scan a picture of the 2005 Wahunsenakah Lodge activity patches together, forming an arrow. I'm only about 3.5 years late posting this. The combined parts extended well beyond the length of my Canon scanner, so I had to do some photoshop work, scanning each end and combining them to create the image you see above. 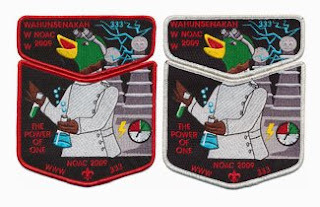 Wahunsenakah Lodge also issued puzzle piece activity patches that form a larger image when combined together in 2000 (arrowhead) and 2002 (fleur d'lis). You can see them one piece at a time or together on the Wahunsenakah Lodge Activity Emblems page. 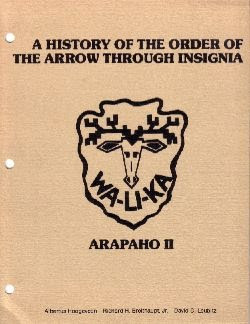 Long before there was a Blue Book for OA Collectors the standard reference for Order of the Arrow emblem collectors was Arapaho II - A History of the Order of the Arrow Through Insignia. Arapaho II was a collaborative effort by Albertus Hoogeveen, Richard Breithaupt, and Dave Leubitz, first published in 1979 in loose leaf format. 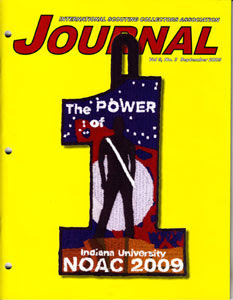 Although it was not the first attempt to catalog OA issues, it was a landmark publication is the scope of it's efforts to publish not only listings but also pictures of each Lodge's known issues. Arapaho II remains a vital historical document since the authors diligently researched topics including lodge names, totems, and charter dates in official OA records while onsite at the BSA Headquarters, then located in New Brunswick, NJ. Those archives were later destroyed, leaving Arapaho II as the only remaining authoritative resource for this vital historical data. When I began collecting OA patches in the 70's my flap patches were stored in ziplock bags with matching cards from Alhoo Supplies, Albertus' company for patch collecting goods. Albertus was a pioneer in cataloging the first issues of Council Shoulder Patches when they came on the scene in the early 70's, publishing Arapaho I which illustrated these colorful replacements for the prior red and white community and state strips. Although CSPs were popular because they were not restricted like most OA items were at the time, there were still rarities, like those from merged councils. Albertus gave me a CSP from the newly merged Grayback Council and I still treasure it as a great example of a senior collector aiding a newcomer to the hobby. Recently a fellow collector asked me for a copy of the Kecoughtan Lodge listings from Arapaho II and when I wasn't able to quickly find my copy I asked Trey Walls if he could help out. 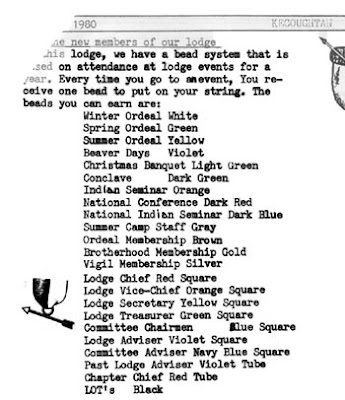 He generously provided scans of not only Lodge 463 items, but also Lodge 483 as well. Albertus kindly granted permission for me to share these copyrighted items on my web site, so they are offered now as aids for researchers and collectors of those lodges. You can download and view the 4.6 MB PDF document including these listings from Arapaho here. In this modern age of computers, digital cameras, and the internet it's hard to appropriately appreciate the vast amount of effort and expense that went into early collecting publications like Arapaho II. Every image was shot on film and developed, every word typed and laid out painstakingly one letter at a time on typewriters, and every bit of information gathered and confirmed in person or by telephone call or postal letter. What we can accomplish in a few minutes then took weeks or months to share. We owe a lot to pioneers like Albertus for setting the standard high for accuracy and detail that remains valuable decades later. For aspiring collectors of any OA Lodge, the holy grail is a "complete collection" of everything ever officially issued by the Lodge. For most lodges this is a virtually impossible task since some items had limited distribution or for older items simply not commonly found anymore. 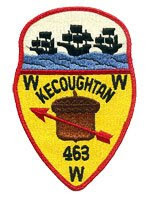 Kecoughtan is no different, but that shouldn't deter you from trying to assemble a complete collection. A complex question could be "what comprises a complete Kecoughtan collection?" Rather than delve too deeply into the finer points of defining which items should truly be considered official issues or which items are definite varieties that deserve a separate listing and which don't I'll keep the answer simple. Ready to get started? Here's a handy checklist created with Dave Pede's awesome Blue Book VI PDF Generator. Note that the Blue Book doesn't list items like coffee mugs, hat pins, keychains, or belt buckles, so once you assemble the 202 items above there's still plenty to keep you busy. Note: The collection pictured above is not mine. Thanks to Ray Ellis for sharing this picture with me of a beautifully displayed Kecoughtan collection. 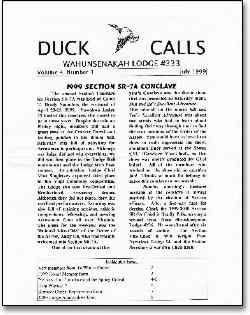 Larry Johnson kindly forwarded me scans of the Duck Calls newsletter from Lodge 333 for July, 1999 for inclusion on the online archive. I've created a PDF document of this edition and it's available now in case you've been waiting to find out what happened at the 1999 SR-7 Conclave hosted by Nawakwa Lodge. Check the Duck Calls page for all of the online editions, and if you have an edition that's not posted please let me know! 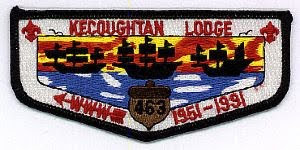 I took time to review my Kecoughtan Lodge 463 collection and confirm that I still have more than a few needs. You can have a look at the most recent version here. The items on the list are linked to pictures of the patches to make it easier to identify them quickly. 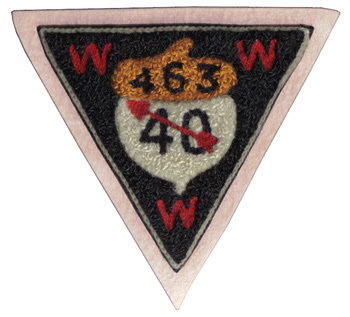 That 463 X12 pictured above is one of my Honor Member patch needs. If you have any of these items that you are looking to trade or sell, please let me know! When the site that became kecoughtan.com originally came online in 1996 there was no such thing as Google. Yahoo, Lycos, Altavista, and many others were the services that people used to find web sites. When it came time to add search capabilities to this web site I had a short list of choices and selected freefind.com which has worked as advertised. Today I implemented a new custom google search on kecoughtan.com which enables you to search content on this site exclusively. Google has crawled every page and every PDF on this site, so your search will now include all of the newsletters and history documents as well. Last weekend I decided to spend time updating the long-neglected web page devoted to the Chapter Emblems of Kecoughtan Lodge. Way back in March Larry Johnson sent me pictures of several event patches for camporees sponsored by Wicomico Chapter that I needed to add. Most of all I wanted to update the listings on the page to match those in Blue Book 6 - Standard Order of the Arrow Insignia Catalog. 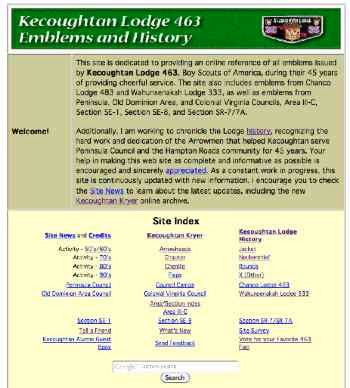 The Kecoughtan Chapter Emblems web page was originally created over a decade ago using Blue Book 2 (1998) which did not include any chapter emblem information. 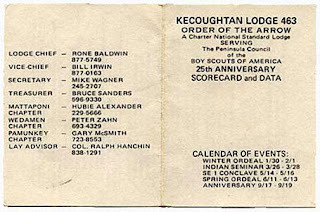 The listings were based upon the photocopied sheets of Kecoughtan Lodge patch data sent to me by the late Ron Godby in 1996. I was surprised to discover that Blue Book 6 claims there are two versions of the first Pamunkey Chapter jacket patch, with the difference being whether the embroidered deer is brown or dark brown. It also claims that there is a second jacket patch for Piankatank Chapter with a dark blue border and multicolored background. 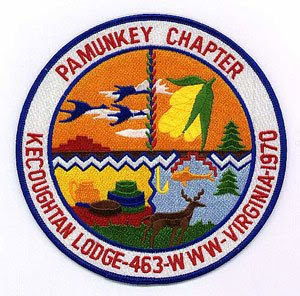 I've never noticed any difference in the color of the deer on the Pamunkey jacket patch, and I've never seen any Piankatank Chapter jacket patch other than the pentagon-shaped J1. How about you? 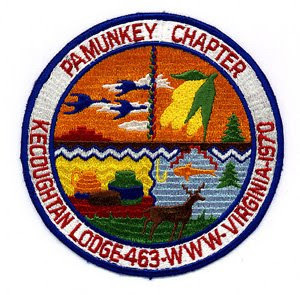 If you have two Pamunkey Chapter J1 patches with obviously different deer, I'd love to see a side-by-side picture. If you have knowledge of any Piankatank jacket patch other than the J1, please let me know. Hidden on John Pannell's oaimages.com web site is a fascinating bit of history - a complete copy of the very first Blue Book. 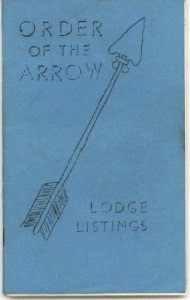 Published in 1958, the official title of the publication is Order of the Arrow Lodge Listings, but the color of the cover is the only clue you need to understand how the later versions got their name. 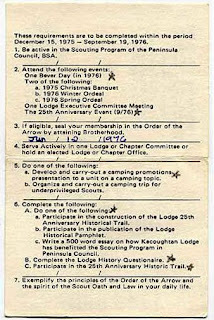 Compiled by E. Forrest Reynolds, the booklet is barely over 50 pages, but these were the early days of the Order of the Arrow, and patch issues were still scant. Still, the amount of effort to compile the data in this document is almost incomprehensible when you remember that most of it had to be gathered in person or through postal mail. The Kecoughtan entry lists just two items: an X issue and an F issue. "Wait!" 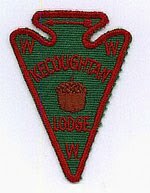 you exclaim; "Kecoughtan Lodge never issued a flap patch that had a twill background." That is true, but as the abbreviation legend for this document explains, "F" simply indicates a flap shaped patch. It wasn't until later that "S" was used to indicate a flap with a solid embroidered background and "F" for flaps with twill background. 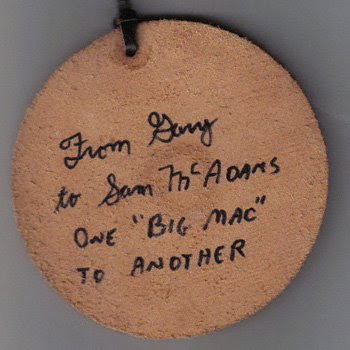 Check it out and be sure to tell John you appreciate his efforts to preserve and share such a vital part of OA patch reference history! Can you spot the fake Kecoughtan Brotherhood flap? The Kecoughtan flaps featuring confederate flags were replaced with new designs in 1989 at the demand of a new Council executive. 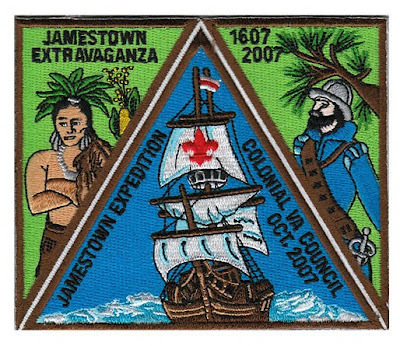 S13, 14, and 15 displayed the three ships that landed at Jamestown in 1607, and a special flap with this design was created specifically for the 1989 Boy Scout Jamboree (S-16). Coincidentally, the 1989 Boy Scout Jamboree held at Fort AP Hill, Virginia, was where the first and only known Kecoughtan Lodge fake flaps were introduced by sources still unknown. The fake flaps were computer-designed reproductions of the Lodge's S-10 Brotherhood flap, and continue to fool many collectors and traders even to this day since their likeness is so similar to the genuine article. stars on flag are not well defined, hard to see "points"
white outline stitching is tight and close to acorns and flags. Now can you tell which one is fake? If you chose the bottom flap in the picture, you're right. You can view all of the official Lodge 463 flaps on the Kecoughtan Lodge Flap Issues page. Fakes and other unauthorized emblems are cataloged on the Unauthorized/Unofficial Issues page. 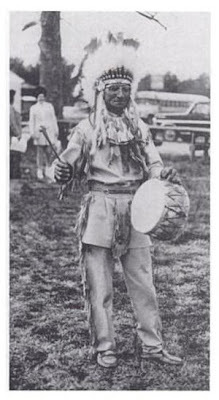 Then Pamunkey Chapter Chief Gary McSmith lost a close election to Bill Irwin at the 1976 Spring Ordeal to become the Kecoughtan Lodge Chief succeeding Rone Baldwin, according to the July edition of the Kecoughtan Kryer. 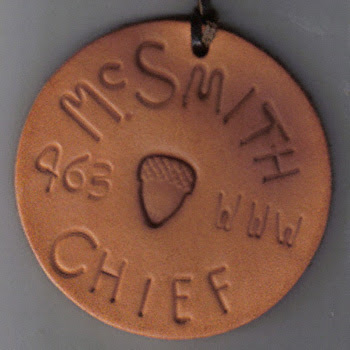 McSmith's campaign for Kecoughtan Chief included a leather round emblem (see above) that is often mistaken for an official Kecoughtan issue. Although it includes the Kecoughtan Lodge totem and number, it was not issued by the Lodge, but remains an interesting piece of Lodge history. 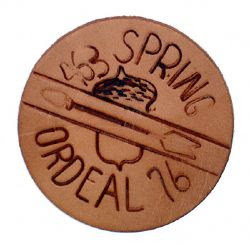 Gary and his father Duane McSmith hand made leather round emblems for the 1975 Section SE-1 Indian Seminar that are official Section emblems. Thanks to Michael McCaughan of Blue Heron Lodge for sharing the images above with me. To see other interesting unofficial Kecoughtan Lodge emblems, check out the Unknown/Unauthorized Issues page.